What if I told you that it’s possible to get an effective annual return of nearly 10% over time – without the risk of stocks, real estate or other volatile investments? I’m pretty sure you’d wonder what I’ve been smoking! But I’m going to prove to you how you would have to get a 9.94% return every year in a tax-deferred account like a 401(k) or IRA to equal the return of a Bank On Yourself Plan over the last half century. To quickly recap, Bank On Yourself relies on a super-charged variation of an asset that has increased in value every single year for more than 160 years – dividend-paying whole life insurance. It’s never had a losing year – EVER – including during the Great Depression. It’s not subject to the ups and downs of volatile investments like stocks, real estate, gold, currencies or commodities. I’ve often said that Bank On Yourself isn’t about the rate of return you get. It’s about the unbeatable combination of advantages it gives you, which include safety, predictability, guarantees, liquidity, control of your money, plus some juicy tax advantages. 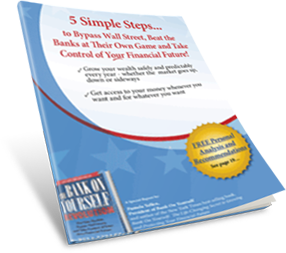 Download our FREE Special Report and a chapter of my latest New York Times best-selling book here to learn more. As Will Rogers noted, “The return of your money is more important than the return on your money.” However, the long-term return of a properly structured dividend-paying Bank On Yourself-type policy is nothing to sneeze at. To prove our point, we invited one of the Bank On Yourself Authorized Advisors to share a recent annual statement for a policy his father purchased in March of 1969 – a few months before the advisor was born. Dad paid the annual premium of $1,054 out of his pocket for the first 19 years. After that, he let the policy “self-fund,” meaning he let the policy’s dividends pay the premiums. That meant Dad paid in a total of just over $20,000, and the annual statement you’ll see in the video shows the cash value had grown to over $153,000. The advisor then uses a calculator to demonstrate that the annual return on that policy to date was 6.19%. And Dad enjoyed it without the risk or volatility or sleepless nights of stocks, real estate and other traditional investments. We captured the surprising proof in this video. Now I know a lot of people who would happily bypass the heart-stopping roller-coaster ride of the Wall Street Casino for a return like that. You may even be in that camp yourself. … We’re not even close to comparing apples to apples! You see, when Wall Street and investment advisors tout the return of mutual funds or the market, they typically (and conveniently) neglect to mention the impact of fees and taxes. But the numbers you see in a Bank On Yourself plan projection or annual statement are net AFTER all fees, commissions and taxes have been deducted. Much like buying a TV or a couch, the costs of manufacturing and sales are already included in the price – or in the premium, in the case of a Bank On Yourself-type policy. So you’re always seeing your true bottom-line numbers. That’s very different from mutual funds, investment accounts, 401(k)s and IRAs, where the fees are tacked on every year and compound against you. So the question you need to answer is… what return would you have to get elsewhere to equal the return of a Bank On Yourself plan? Let’s say you’re investing inside of a tax-deferred 401(k) or IRA (which is where the bulk of our savings is, according to the Federal Reserve). When you start taking withdrawals, you have to pay taxes on every penny you take out. So we then demonstrate – using a calculator so you can see it right on the video – that you’d actually have to get 8.84% in a taxable account to equal the return of the Bank On Yourself policy. … All those accounts have fees that are going to reduce the value of your account – and those fees will almost always total at least 1%. So in the video, we then demonstrate that, once you take into account the fees, you would actually have to get a 9.94% return – every year – in a tax-deferred 401(k), IRA or similar account to equal the return of the Bank On Yourself policy that’s been giving Dad financial peace of mind for the past 46 years. You’ll also see how the advisor who sold Dad this plan made only a $1,400 total commission, while the investment advisor would grab more than $22,000 in fees, given the same annual contribution! Download our FREE Special Report and a chapter of my latest New York Times best-selling book here to learn more. Yours would be custom-tailored to your unique situation, goals and dreams. To find out what your bottom-line numbers and results could be if you added Bank On Yourself to your financial plan, request your FREE, no-obligation Analysis. Find out how you can have it all – safety, liquidity, predictability, guarantees, tax advantages, access and control. You have nothing to lose and a world of financial peace of mind to gain. The alternative is to worry and wonder when the next market crash will wipe out 50% or more of your life’s savings… again. It’s your choice. As soon as I file my past 3 yrs taxes. The first thing I’m going to do is sign up with you. I have money that I can transfer from a few different accounts. You have no idea how much I’m looking forward to this new chapter of my life. Thank you for the emails that you continue to send. The law of attraction is real and I will be able to leave a legacy. We’ll be here when you’re ready! Jeanine, I’ve been a very happy client of BOY for years. It goes so hand in hand with the logo of the company that I represent…..”Worry Less….Live More!” You’ll LOVE Bank On Yourself! What does the Insurance company do w the sav8ngs portion of premium? If i die do i get tbe insurance and the cash value? Why would i want to pay interest on my money by borrowing it? Oh..perhaps its not my money? I’ve looked it hundreds of Whole Life policies and I’ve never seen any of them returning anywhere near 6% buy term and invest the difference always wins. You can learn about what really happens to your cash value when you die here. You’ll find the answer about buying term and investing the difference here. Read about policy loans here. Presumably the $1,054 premiums paid for 19 years were with after-tax dollars. So, to do a fair comparison (apples-to-apples) using tax-deferred alternatives such as IRAs and 401(k)s, you’d have to gross up the amount being invested. So, for the 30% tax bracket used in the illustration, you’d be able to invest $1,370 in a tax-deferred account and then pay taxes upon withdrawal years later. Now what rate of return would I need to end up with the same net income in retirement? Assuming I annually take out 4% of my nest egg of $153,000 to produce a $6,120 income, with a 30% tax bracket I’d have to take out $7,956 annually in order to obtain the same income. Using the same 4% annual withdrawal, my nest egg would have had to grow to $198,900 by 2012 to achieve the same result. So my question is: what annual rate of return is needed in investing $1,370 per year for 19 years and then stopping to build a nest egg $198,900 over the same timeframe? Does this come out to the same 9.94%, including 1% fees? Not sure I completely follow you, but the problem with trying to back into a number when you’re investing in the market on a tax deferred basis is that you will NEVER be able to predict what your nest egg will be worth on the day you expect to tap into it, nor will you be able to predict what the tax rates will be then. Most people we talk to believe tax rates can only go UP over the long term. Saving (versus investing) is what you do with the money you can’t afford to lose or to wait 20 years or more to recover. A better comparison would be a Roth IRA or Roth 401K, where the funds put in are all after tax dollars and the funds coming out are all not taxable. Of course that would leave you with a lower return to brag about compared to the Roth funds. Yes, predictability is nice, but if you want to make a case based upon the rate of return, you need to compare it to a Roth to compare apples to apples. I think you may have missed the whole point of this article. Bank On Yourself isn’t just about rate of return—it’s about an unbeatable combination of advantages you get that include safety, liquidity, guarantees, tax advantages, access and control. You only get ONE of these advantages with a Roth Plan (the tax advantage). As noted in this article, most people snear at the rate of return of a whole life policy, but over the long term, it’s nothing to turn your nose up at. Then, when you consider the other advantages of dividend-paying whole life, it wins—hands down. That’s why my $100,000 cash reward to the first person who has a strategy that can beat Bank On Yourself has never been claimed. 6.19% in the video demo, no? I guess you missed the part about how that’s only HALF the story, because the return of a life insurance policy is AFTER all expenses… and is NOT taxable. After you take those two things into account, as explained above, you would have to get a 9.94% return every year in a tax-deferred account, like a 401(k) or IRA, to equal the return of the policy show in this video. The question for you really is how much of your wealth do you want to position that will never be subject to an income tax again? While your figures diagnosis is important to understand, your tricking yourself into believing that the powers in washington won’t change the rules of the game. However, they will. So I personally want to remove all legislative risk from my wealth building and the only way I can do that is by funding these types of contracts. If you want mutual funds in IRAs, you might consider over funding your life insurance policy first and then borrowing against it to fund your IRA. That way one dollar will be doing the work of 2. I also suggest you talk to Mrs. Yellen as this is something you ought to understand. What you’re really saying here isn’t that a Bank on Yourself plan yields 9.94% annual returns, rather that a non-BOY plan would have to deliver 9.94% returns before taxes and fees to match a BOY plan with the same contribution rate. That’s a different statement entirely. Furthermore, won’t you have to pay taxes on your life insurance cash value withdrawals after you withdraw all of what you put in as premiums? Unless you take out policy loans, which means you have to pay it back anyway. That’s exactly the point I make in this article – that you would have to get a 9.94% annual return in a tax-deferred account like a 401(k) or IRA, to equal the return of the nearly 50 year-old policy shown in the video. And for most people who use the Bank On Yourself method, they ARE using it as a safe and predictable alternative to traditional retirement plans- where they don’t have to worry about the next crash taking away 50% or more of their life’s savings, yet again. It’s the best sleep-though-the-night financial security blanket around. You need to study up a bit on how people take income from these plans in retirement. They typically withdraw their dividends up to their cost basis, then switch to policy loans, which ultimately lets them access their cash value with NO taxes due, under current tax law. They do not plan to pay the loans back, of course, and there is no requirement to do so. There are other options, too, including annuitizing your policy, which goes again to the amazing flexibility of these plans. So, let me get this straight. If I wanted to get my “‘Cash value” I would have to borrow it and pay interest on this amount? Also, what happens if I were to die? Would any of my heirs get this ‘cash value’ amount. What type of return am I really seeing on this account? And what is the TRUE premium on the life insurance policy of $100,000? Would it be more beneficial to purchase a TERM Life insurance policy and ‘invest the difference? I would want to know that if I were to die, that my family would receive the death benefit AND the CASH from the investment (IRA, Roth IRA, etc.). I also could borrow money out of my 401k and pay myself the interest, correct? Please show me how this system would be any better. By the way, I have been licensed to sell life and securities in the past. I wouldn’t have a clue where to start answering all these questions (which show your mind is already made up). So I’ll just tell you to take our $100,000 Challenge. If you really have found a better strategy, you could receive a $100,000 cash reward. What happened to all the dividends a person would have received in Paul Nick’s example of “what if they had been invested in the market?”? The geometric price return for the S&P 500 from 1969-2012 was 6.13% (the number Paul used). The geometric TOTAL return for the S&P 500 from 1969-2012 was 9.51%. That’s a HUGE difference! His example shows a $223K ending balance (before his 1% annual fee and taxes). Not sure why he stopped at that balance. The ending balance in 2012 would have been $253K. Take a wild guess what the ending balance would have been (again, before fees and taxes) had Paul used the S&P 500 TOTAL return? $749K! That’s nearly $500,000 difference! Now I see why he didn’t use the S&P 500 total return. One of the many benefits of a dividend-paying whole life policy, especially one structured the Bank On Yourself way, is that the growth in the policy IS the return you actually get it. I know you’re going to fight this tooth and nail until the day you die. I suspect you’re a financial advisor, and you give your clients this trashy advice. I feel bad for your clients, and I feel bad for you. At any rate, I’m done posting your comments on my blog, and I’m done wasting my time answering them. I don’t understand why you won’t reply to him. I’m interested in Bank On Yourself, however Warren Buffett said the average investor should invest in low cost index ETF like the S&P500 ETF. And from John’s calculation, it seems that the return is higher if we had invested in S&P500. I know the average irrational investor earn less than what John calculated due to poor investment decisions, mutual fund fees, etc, but I’m just curious why you would say John is ridiculous. Is there something wrong with his calculation? Alright, Alan – I’ll take a shot at it and I’ll limit my comments to something critical John Patterson missed, plus demonstrate how ridiculous John’s comments and calculations are. But the first fund that tracked the S&P 500 Index didn’t even come into existence until 1976 (it was John Bogle who started it) and it had very few investors. Guess what the sales charge of that first fund was? A whopping 6% except on the largest accounts! That means there is NO WAY anyone could have gotten the results of the S&P 500 Index long-term. Paul compared is father’s dividend-paying whole life policy with the actual S&P 500 Index since 1969, because it’s a benchmark most people can relate to (even if you couldn’t actually get that return yourself, for the reasons I just mentioned). And what investment managers also don’t get is that they insist on comparing the hypothetical (read “hope and pray” ain’t-never-gonna-actually-happen-in-real-life) return of the S&P 500 Index with the ACTUAL real-life, all-principal-and-gains-locked-in results of the policy analyzed in this post. Well, they probably do know it’s a ridiculous comparison, but they’ll never admit to it. And the second point every naysayer missed is mentioned near the end of the video (at 16 minutes and 40 seconds): The policy examined in this video was issued well before it became more common to include the riders that make your cash value grow more efficiently. At the link below you’ll see an example of a policy like the one Paul shows in the video and compares it to one with the same premium being paid into, but structured the “Bank On Yourself Way” with much of the premium being directed into the riders. And with that, I am definitely done addressing these ridiculous (and they are ridiculous!) comments. I have a lot better ways to invest my time. Your comment made my day, Derek! You’ve pointed out a few key benefits of the Bank On Yourself strategy that people absolutely love, once they understand and experience them. You are in great hands with Paul as your Bank On Yourself Authorized Advisor, as you’ve already discovered. If you use paid up additions to get you to that level to have a high dividend level, yes you will not pay taxes on those dividends. If you take a qualified loan on the policy, it is as a loan and you will not pay taxes, and the face value of the policy will remain in effect as long as you pay the maintenance fees etc if you take a loan. If you take a distribution that is a full surrender or a dividend payout, it is subject to capital gains taxes. The government will get theirs regardless in that situation. The insurance company will 1099 you, because you’ve earned income. Your heirs will not pay a tax on the face value of the policy however unless they roll it into another plan and take distributions from said plan. The nice thing though is your paying the taxes on a distributed amount and not on the whole, and if the face value is involved and your heirs roll theirs into an estate owned WLP with the same parameters, their distributions can grow in the same manner for the next generation, creating generational wealth. The key is to put this together correctly and through a company that is not just a mutual, but a top rated A.M. Best company. The company has to have enough assets to cover their asses and the fine print has to not have riders galore making it impossible for you to get to your money. That is why a qualified agent with integrity is the only person you should use in this adventure. Too many try to get rich quick and make the rest of us look bad. To my way of thinking, if a 300 billion dollar retirement fund, paying tens of millions a year in expert guidance, can’t average 7.5% in the long run, then what hope do I have? Well said, Bruce! Even most so-called “experts” can’t equal, let alone beat the market. According to the Hulbert Financial Digest, 80% of the experts underperform their respective benchmarks. if i borrow against the life policy do i have to put those monies back? My wife and I are in our late 60’s. Does B.O.Y. make sense for us to start? If memory serves, isn’t cash value growth over policy expenses taxed on withdrawal? So to compare apples to apples, since you taxed the stock investment, shouldn’t you tax your own cash value as well for accurate comparison? It IS an apples-to-apples comparison, because it’s possible to access your entire principal and growth with no taxes due, under current tax law. You do this by withdrawing your dividends up to your cost basis, and then taking loans against your cash value. So what happens to my invested money versus my insurance amount at death? For example, if I have a $500,000 policy and the invested amount is $153,000, will my family get $500,000 or $653,000 when I pass away? You’ll find the answer to your question here. Hi regarding this video and the annual rate of return that it equals 11.4% you left out the fact that if the person would of put the money in the market he would also have to buy term insurance plus the lost of opportunity cost of that money. What is the difference in your program (which i totally agree with) and a simple non mec IUL? Two or three styles of course, from a legacy 2nd to die ,or early cash value builder to help run a business with ? Backed up of course with a super cheap 20 or 30 year term policy for the 2nd to die holder to sustain a life style and make premiums until they want to stop the premiums or want to start taking loan distributions , usually for the rest of their life. Just re read my own post. That should read ,to take out non taxable loan distributions . I just finished an IUL thru an AM Best A+ rated company . The young man is 30. He has agreed to put in $500 a month till age 75 and a goal to stop premiums and start taking the loan distributions till age 110. He will put in $270,000. He or she will draw out approximately $8,000,000 at about $230,000 a year unreportable ,tax exempt income, and if the 2nd to die does pass on before age 110, what is left in the face value still goes to the heirs tax exempt. The numbers are currently calculated on the past 25 years of their data. Of course he or she can adjust any of these parameters any time he or she wants to with little more than a phone call. ?? Several other benefits such as long term care ,acute illness , disability etc on both the IUL and the term. IUL only of course after the term expires and can convert the term to whole life to recover his paid in premiums calculated on his premium level before the term expiration date. These are actually pretty minimalistic numbers built on a conservative platform this old line legal reserve company is known for. Not a publicly stock held company. The only thing we know to be true for sure about an illustration is that it will NEVER come true, and that’s especially true for IUL policy illustrations.